Powers: He has the ability to make objects explosive with a touch. The nature of the object can enhance the explosiveness eg. Gasoline would make a larger and more potent explosive than a chair. Howell Rice was apparently a gang member who was present at the Big Bang event. He survived and was granted superhuman powers to make things explode. Unlike the other surviving Bang Babies he was a nationalist and Muslim black supremacist who believed in “separation of races”. He also believed in a conspiracy against the black race by the whites who held all the economic power and prestige. He made his public debut by bombing white supremacist headquarters and even a Jewish temple full of innocents. This caused a riot to erupt between the Jews and African-Americans on the scene. Luckily Static arrived on the scene and broke up the riot but Commando-X escaped (Static #5). 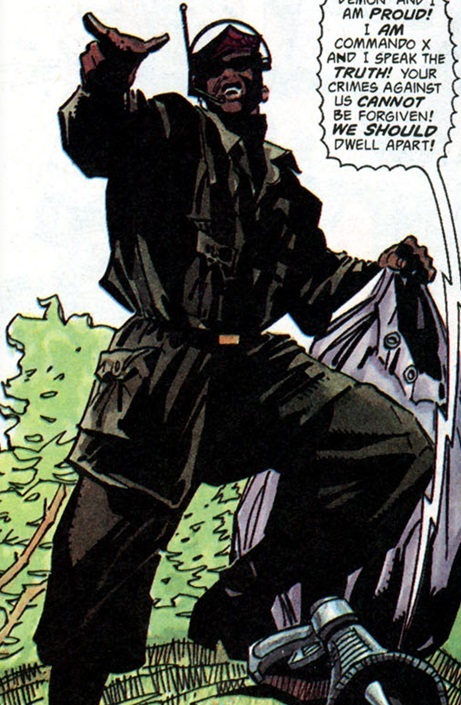 Static came face to face with the villain at a peace rally where those present were condemning Commando-X’s actions. Here Static had to save the rally from Commando-X’s volleyballs rigged to explode (Static #6). He eluded capture once more. Static manages to track him down and plays at sharing his ‘radical’ ideas to gain more Intel. Commando-X unwittingly reveals his plan to bomb City Hall (Static #7). Commando’s last gambit was to bomb the radio station but static tracked him down, defeated him and turned him over to the cops (Static #7). ← Denzel Washington is Green Lantern John Stewart? Going to go back and re read my Static back issues and get re acquainted with this character, thanks to this entry.